Stitchers often ask me what fabric is used for Brazilian Embroidery. Unlike the ‘even weave’ fabrics necessary for Counted stitching – Trigger fabric is used most often for Brazilian Dimensional embroidery. Many other fabrics are suitable, designers prefer Trigger. You may also find it referred to as Blazer Poplin, it has a tight weave with a nice weight for the stitches used in Brazilian Embroidery for example, bullions and cast-ons. If you are doing a special project use the fabric appropriate – albums, totes, wedding accessories or apparel. For general Brazilian Embroidery stitching, Blazer Poplin ( aka- Trigger ) is used. Introducing the star of the season, Miss Tia Potts. Everyone will be talking about her with the Swarovski crystal jewels, her stylish silk and Japan red around her middle. Look at those lovely bright flowers to cheer the season. You really must stitch Miss Tia Potts, she is the socialite of the year. Miss Tia Potts design package does include the Swarovski crystals, Kreinik Serica silk and Kreinik Japan red thread. Stitch and flower instructions are found in Art of Dimensional Embroidery, by Maria Frietas; additional instructions are included in the package with the fabric print design. Assorted size Milliner needles, hoop, embroidery scissors and glue. or click on Miss Tia Potts picture. Can’t do without tool ! A few nights ago when I was stitching with EdMar Frost thread, I didn’t have my trusty little Thread Stretchers in the Mesh Project Bag I was working from, so I used my fingers to wrap the thread around, like you would dental floss, to give it a little stretch. Well, the next day at work, I found I had a cut on my finger from the thread. Such a little cut, but it was bothersome and could have been avoided had I used the Thread Stretchers. Not wanting to waste a minute of my stitching time to find the Thread Stretchers in another Mesh Project Bag, now I have a set of the Thread Stretchers in each of the Mesh Bags that I will be using either Lola or Frost thread. The other weights do not seem to need this bit of stretching. For several years I tried to avoid Frost thread. Although I do like the weight as far as the appearance of the flowers and stems, it was the weight most likely to twist and kink, since it already has a tight twist. Now, with the assistance of the Thread Stretchers, I look forward to using EdMarFrost thread, instead of avoiding it. What a difference this little gadget makes. And it definitely saves the fingers; or if you have arthritis in your hands as many of us do, the Thread Stretcher is helpful. Thread Stretchers are a must have tool. HINT ~ Use a Dryer softner sheet to swipe your needles. It makes a good cleaner for needles. Keep one in with your stitching supplies. They are available in 6 sizes, reasonable prices. I have found many uses for the larger bags. One thing is, I do not have to fold my project. It can lay flat inside the bag, protected. The other day, my son was doing some errands for me; Post office, bank and a couple returns. I put everything in the Jumbo bag. Nothing was forgotten or lost. He returned it to me with stamps, receipts, etc. in the bag. My Niece likes the larger sizes for her Scrap book and card making supplies. Now to the Bohin needles ~ they are going, going, almost gone. It was a one time opportunity that I had to purchase a quanitity of the Bohin Milliner needles for my customers. I only have 5-6 packages of the Bohin Milliner needles left and less of the Tapestry and Chenille. Get yours before they are gone. Shop the website to purchase your Mesh bags, Bohin needles and new Brazilian Dimensional embroidery and Stumpwork design. Don’t forget the EdMar thread and Trigger fabric. It has taken me over 6 months to find a supplier for Bohin Milliner needles in the US to offer these superior quality needles to you. I am persistant when I want something…. 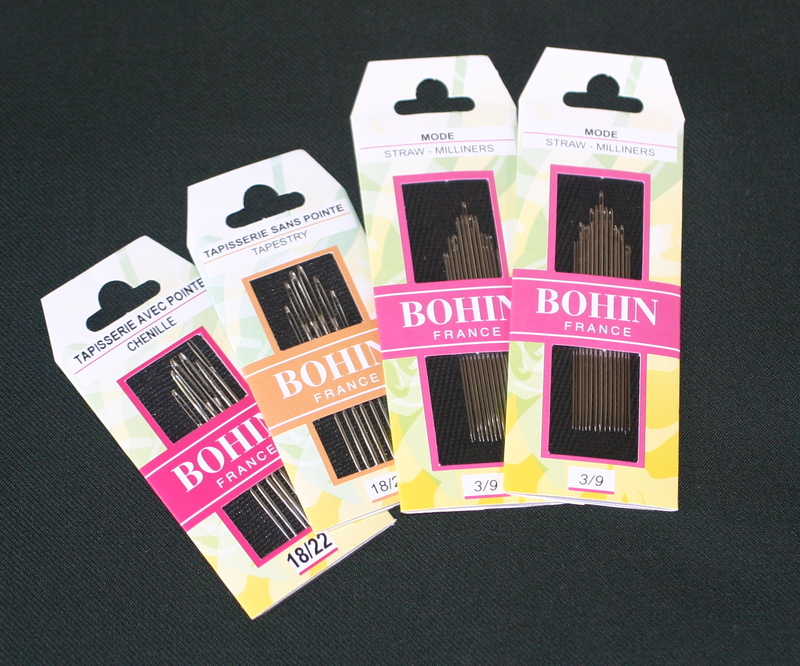 Bohin is well-known for producing quality needlework supplies, and their needles are no exception. 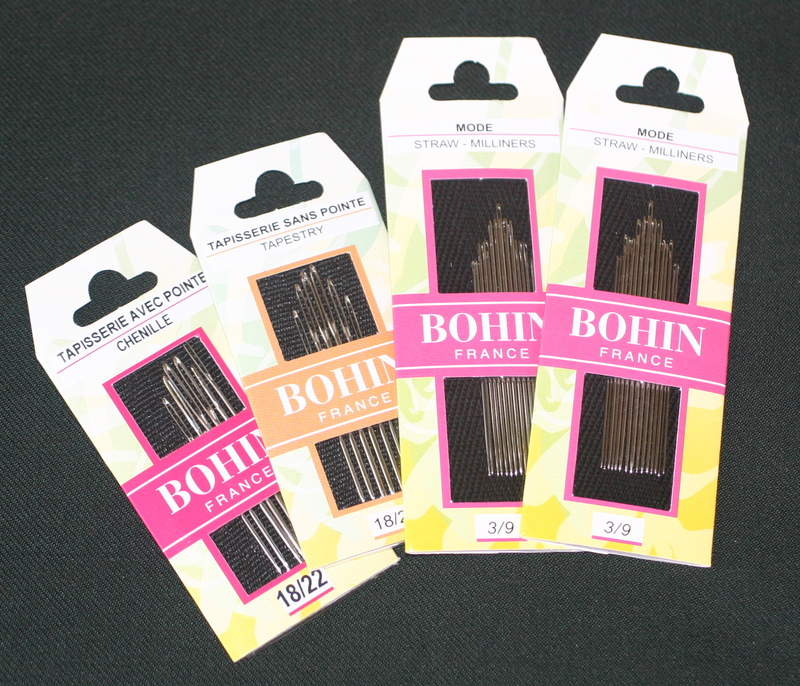 Favored by many expert needleworkers, Bohin needles are smooth, sharp, and long-lasting. The needles are not always easy to find in the US ( especially the Milliner needles ). We are pleased to offer a small selection of these fine needles for your stitching needs. Supplies are limited, though, so order yours now! Milliners, Tapestry and Chenille in assorted size packages. Milliner needles for Brazilian Dimensional embroidery with EdMar rayon thread can be used with other type threads and embroidery. It is a pleasure to offer you this high quality brand of needles for your needleart. For over 25 years I have been so impassioned with Brazilian Dimensional embroidery, now I am taking a step back to enjoy some old fashion Embroidery. Through Needle ‘n Thread newsletter, I found Bird Brain Designs ( I love the name ). She has some Punchneedle and Felt work; but I am enjoying the regular embroidery. Remember, the kind you did as a kid ~ Yes, I am even doing the embroidery on Tea Towels. Bird Brain Designs has a wide assortment of Tea Towels, and some really fun simple designs to embroider. Instead of Pearl cotton I am using my EdMar rayon twisted thread. It slips through the fabric with ease. And the sheen it gives the embroidery, laying on top of the cotton Tea Towels is a very nice effect. My point is – EdMar rayon thread is not just for Brazilian embroidery bullions, cast-ons, etc. It works very well for many types of needle art; Huck, Hardanger, Cross Stitch….. I am using the Iris thread instead of #8 Pearl or 2 strands of floss. There is over 200 colors of EdMar thread. If you need a little break from counting stitches, wrapping thread, looping thread – think about just a kick back fun project. Keep each stitching project in a separate Mesh Bag, so you can pick up your work with everything you need organized in a zippered mesh pouch. I think I can get in a few minutes of stitching before calling it a night. I am trying to get a couple more Tea Towels finished for Christmas gifts. Did I mention they stitch up quickly too. One of the favorite sizes of those wonderful MESH BAGS for organizing stitching projects and many other uses, is finally back in stock. The Med-Small 8″ X 5.5 ” is so popular, they go as fast as they come. 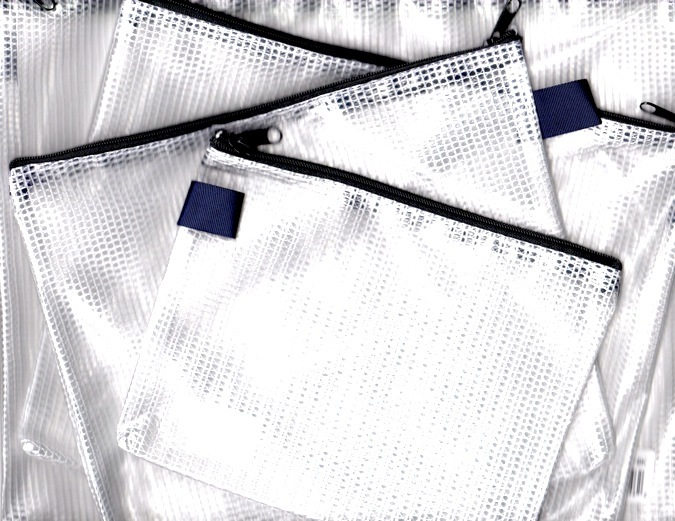 You may wonder what makes the Mesh Bag so much better than a plain zip-lock ~ They are more durable because they are reinforced with a fiber; they have a real zipper closing, which makes them very easy to use and re-use and re-use…. They are clear, you can see which stitching project is in each bag ( or what ever is in the bag ), they tuck into larger bags or handbags.